RoboCup 2010, a six-day event in Singapore during which robot geeks from around the world let their robots play soccer against each other, ended last week with a German triumph. In the final game, the Darmstadt Dribblers from the Technische Universität in Darmstadt beat the FUmanoids, a team of robots developed at Freie Universität in Berlin 7:1. 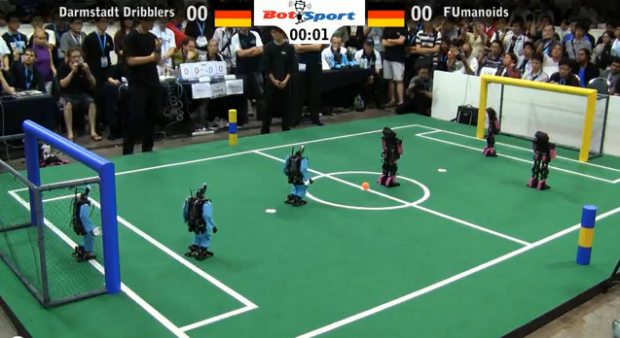 The game was actually a rematch, as the FUmanoids played (and lost 1:11) against the Dribblers at last year’s RoboCup in Graz, Austria. The video embedded below shows the entire final of the tournament in Singapore in fast motion (9.24 min). Head over to to BotSportTV if you’d like to see more videos of humanoids playing soccer against each other.